The veteran warhorses still have it and they have it good, dammit! On their eight studio offering Kai Hansen and the seemingly well-gelled unit of Richter, Schläcter and Zimmerman whip up some of the finest Gamma Rays ever that definitely restore my faith in the stale-ing field of power-tinged heavy metal. Majestic sounds very tight, seemingly a true team-effort, and not surprisingy so as the songwriting credits are divided quite evenly between bandmembers. My Temple revs the gears up high with a speedy beginner that changes tempos nicely to keep the keyboard-laden twisting alive. Cliche-crackers might be caught up on the track, as it takes only 1.43 minutes for the album to start the "Saviour Of The Universe"-tales:) The highly recognizable themes continue on the carry-on-dont-give-up-anthem Fight, which is an excellent fast song with a very sing-alongy chorus and awesome double-bass barrages. One song to be very looked forward to on the upcoming tour. Strange World is really one of my favourite tunes from the record, a faboulous mid-paced groover that really pulses with fist-raising energy. Somewhere In Time-era Iron Maiden, especially Stranger In A Strange Land come to mind, which equals excellence. Hell Is Thy Home keeps the speed churning with murderous riffing that have very strong vibes of Kais songs from the time he was still in Helloween. Hansen himself streches his vocal range in fine form, the guy can still wail with the best of them. Guitar solos abound, harmony-widdlings twist fingers and gang choirs rule the ending of a great song. With its mellow opening and symphonically growing structure, Blood Religion was an excellent song on its live sampling at the Tuska 2005 Festival in July, and it still is now. Some organs bring nice Deep Purpleisms into the mix. More cool soloing that still manages to grab my attention in the quickness splurges all over the middle parts. Condemned To Hell is one my favourites also with the humongously grooving opening riffs that could be straight from Zakk Wyldes fingers with the pinch harmonics and rocking heaviness. The chorus is pure gold that is guaranteed to kill when pulled off live. I can already imagine myself to the front row in Helsinki screaming "HELL! HELL! HELL!" at the top of my aching lungs. Spiritual Dictator is an interesting track in that I dont really care for the opening riff at all, but after it ends and the tune starts pumping to the very sticky chorus, Im sold again. The operatic mid-section sounds very grandiose, exactly like the next track Majesty does (go figure after the title). A slow, sludgy intro leads into eastern melodies and very pompous keyboards, that complete the cinematic feeling of the first half. After this though the solo-section kicks up into fully fledged hard rock-mode, that really makes me feel like jamming the crap out fmy guitar. How Long is probably the most typically GR-like song in the bunch, but this doesnt build up to be a burden in any way, as the driving rhythms and once AGAIN slaughtering chorus grab you by the neck and raise hands. Revelation caps of the album with bursts of choirs, epic melodies and dazzling solos. The subtle ending with the simple jangle of a music box closing with a crushing chord-fadeout works tremendously for dramatic purposes. The Gamma guys really had the catchiness factor and hook-infuser going on full blast during these sessions. The amount of scorching choruses and melodies on the record is big enough to fill a country inhabited with second-rate metal bands that desperately try to come up with something crowds can sing along to. The production is very big but still a bit rough around the edges, giving some very gritty effects to the tunes. The direction of the album is quite amusing as it is both more rock-oriented and simplistic and still more grandiose and orchestrated than the majority of GRs earlier work. 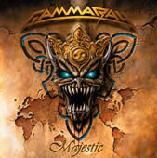 Overall I really hold Majestic as one of Gamma Rays best releases, if not even the best. There isnt a bad song in the bunch as the quality is frighteningly high throughout. A definite album of the year contender for myself, holding top possibilities at the moment with the new Nevermore- and Kreator-albums.